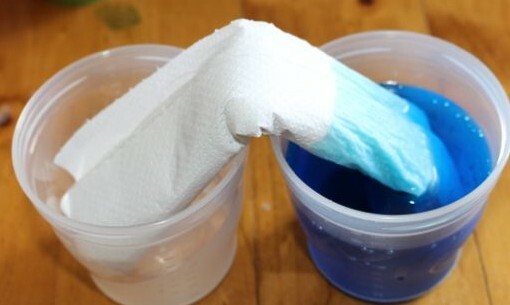 I remember in primary school science doing some activities using paper towel and water and I wanted to show the kids. Paper towel is great at soaking up spills, though I tend to use washable cloths to clean up spills in our house for a number of reasons including environmental and cost (due to the large number of spills that occur…) I still keep some paper towel on hand though, for those jobs when it is unsuitable to use a washable cloth. Prior to placing the paper towel. For this one, we needed two cups, water and paper towel. 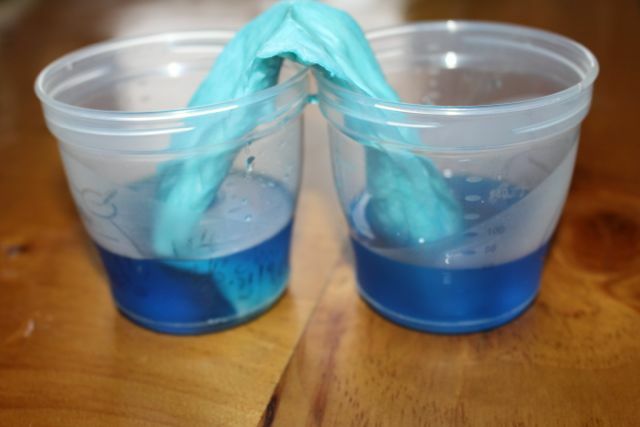 I made the water blue using food colouring, so that it was easier for the kids to see the movement of water. We started with blue water in one of the cups. A few moments after putting the paper towel into the water. I rolled up about three sheets of paper towel into a cylinder, and placed one end into the water, then I bent the paper towel over so that the other end rested in the other cup. We could already see the blue water rising up the paper towel. I asked L what she thought would happen. She thought the water would soak the paper towel, and move over into the other cup. The water did walk over the paper towel ‘bridge’ into the other cup. She also suggested that the water would continue to move along the paper towel until there were equal amounts of water in both cups. I was impressed with her insight. When we checked back after an hour or so. 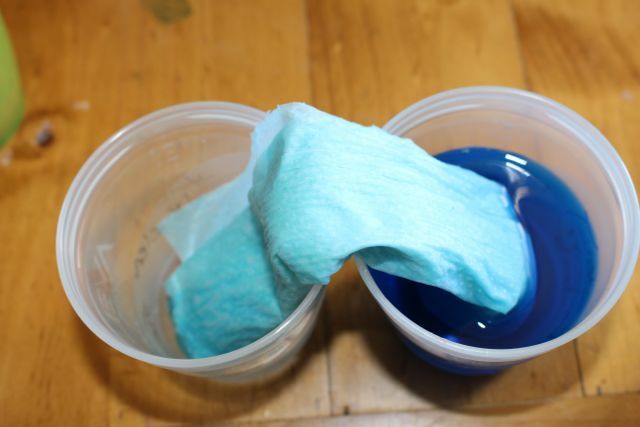 The paper towel is absorbing the water through something called capillary action or wicking. This phenomenon allows the water to be sucked upwards into the paper towel through the small spaces between the towel’s fibres. The force of gravity will eventually become too great for the upward motion of the water to continue. In this case though, the paper towel is draped over into the other cup, which allows the water to continue to the end of the paper towel. Once the paper towel is soaked, the water drips into the empty cup until the water level equalises in both cups. I think we might try some variations on this theme in the future. 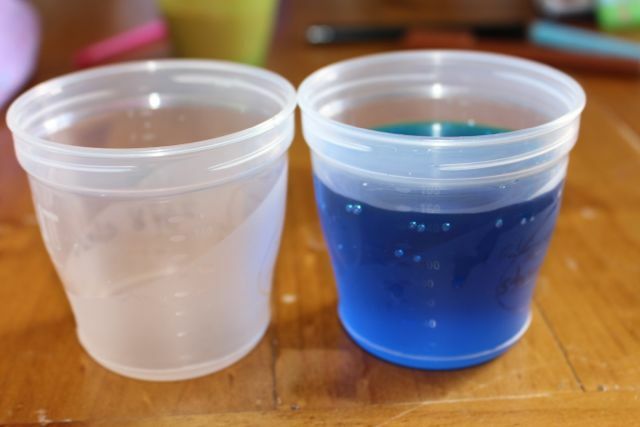 I am wondering what would happen if we started with two or more different cups of coloured water, and placed some paper towel from each of these into the same empty cup. Would the colours mix in the cup? Do all the cups still end up with an equal amount of water? And what happens if the cup with the water in it is placed higher than the empty cup? Does the water still equalise in the two cups? Lots of questions for next time. I will ask these questions of L and A to see what they think.